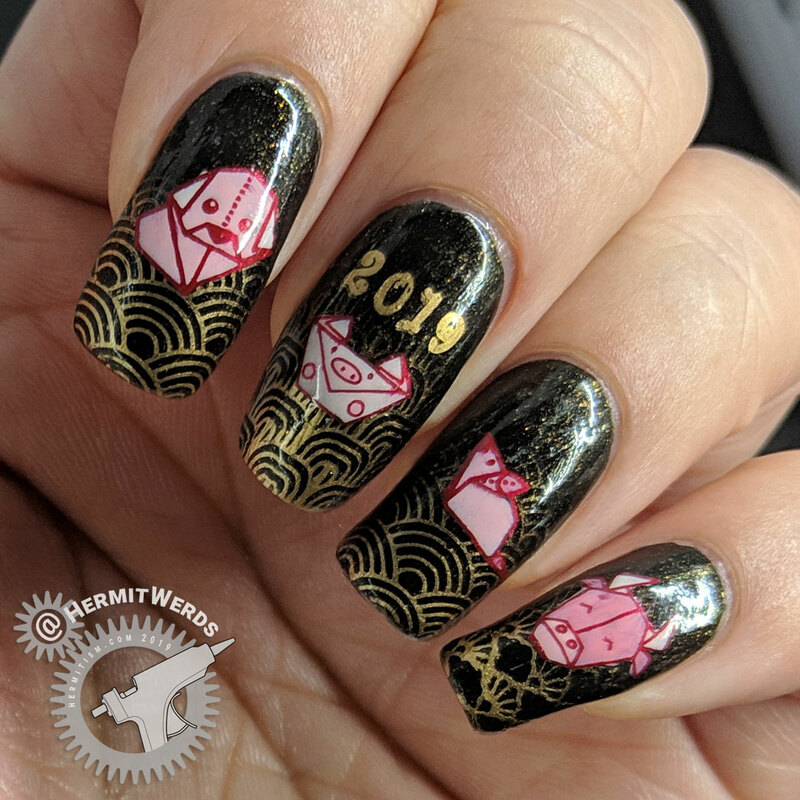 Wow… So I hadn’t quite meant to take such a giant step back from social media, the blog, and nail art. 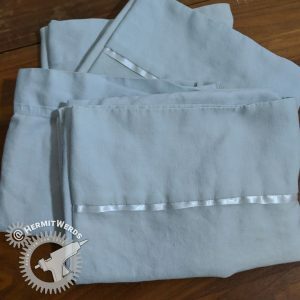 I rearranged my workroom and found I could fit in my grandfather’s old unfolding table that is so perfect for crafts and cutting out patterns and, well, I got sucked into things that are not nail art. I’ve also been drawing increasingly more since November. It started as something to do with a friend (Drawcember) and an activity with my stepdaughter. As time progressed they lost interest as mine increased. And as literal minded as I tend to be I’ve known for a while I love the abstract art of intricate texture and pattern. Unfortunately, nail art is not the best medium for me to express this so I haven’t been exercising that love much. Well, I found a book about zendoodling at the library, which led to a book on the art of Zentangle called One Zentangle a Day. 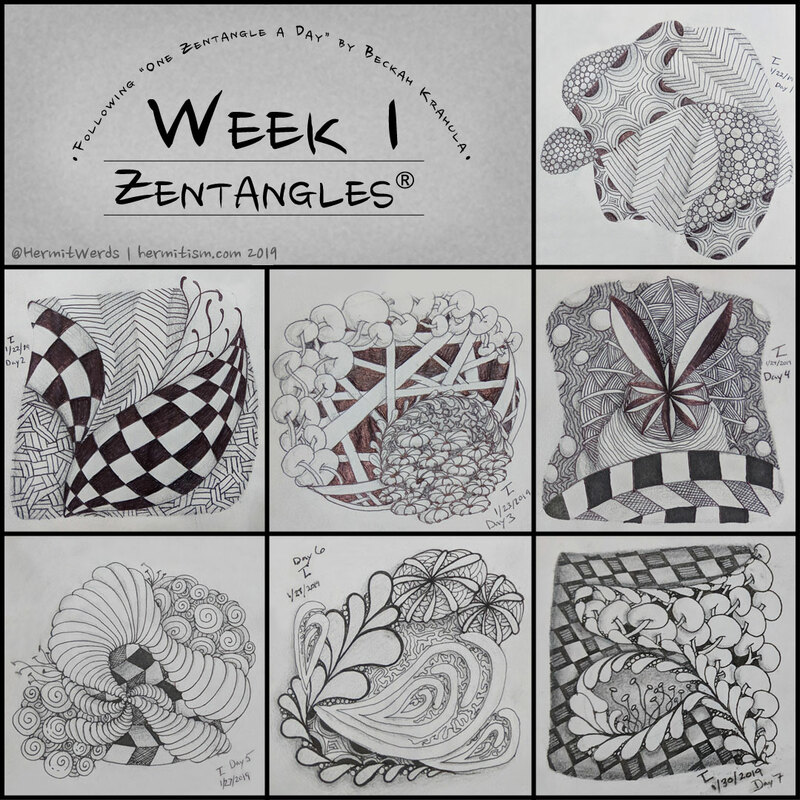 Basically zentangle is a form of mediation using drawing with quality materials and set patterns. I’m still not great on the more meditative parts of it since I forget myself and jump straight into the drawing, but I’m having a lot of fun going through the book’s six week course. I started by using what I had and drawing them in old sketchbooks with old pens, but I’ve finally cut my own zentangle tiles (3.5″ x 3.5″) from old art supplies. I’m sure the experience is nicer with the official tiles (much heavier paper than I own) and new pens, but I can’t justify that expense right now when I have so much Stuff. I plan to continue through the six weeks and we’ll see what happens after that. I still want to go through the Draw a Box tutorials as well. 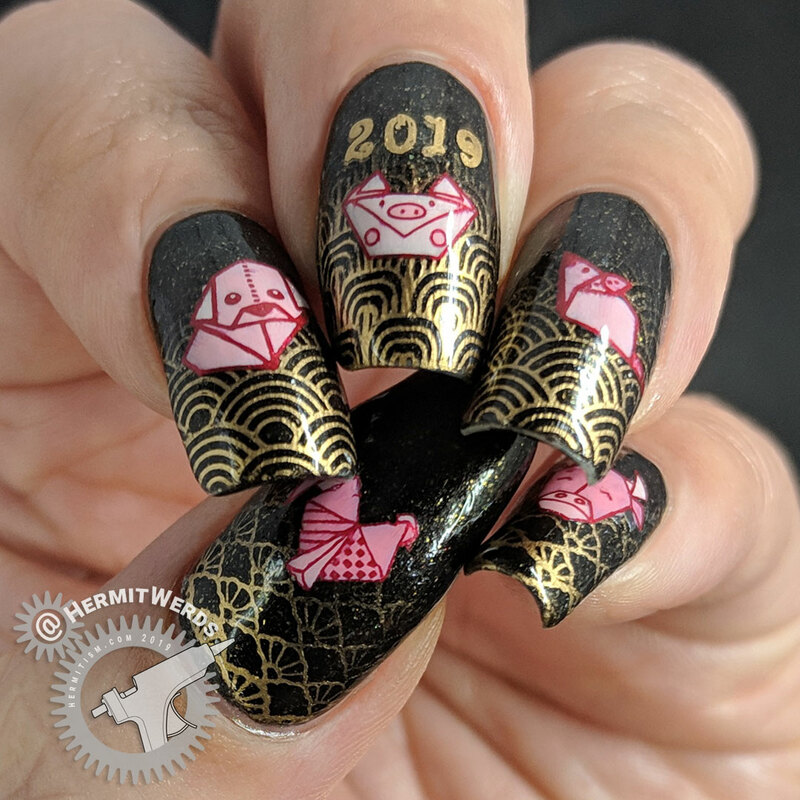 More drawing and sewing this year will mean nail art-ing less, but I don’t plan to quit nail art. I do still have products to review and so many ideas to paint. 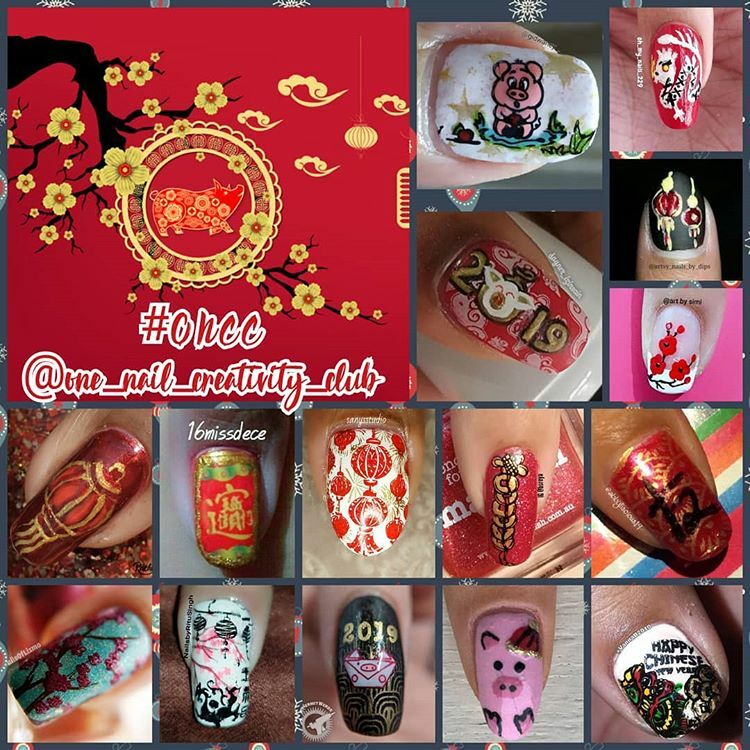 I painted these in January for @one_nail_creativity_club’s zodiac prompt. It was a lot of fun to use all sorts of origami animals that fit the zodiac and this was the perfect year for it. 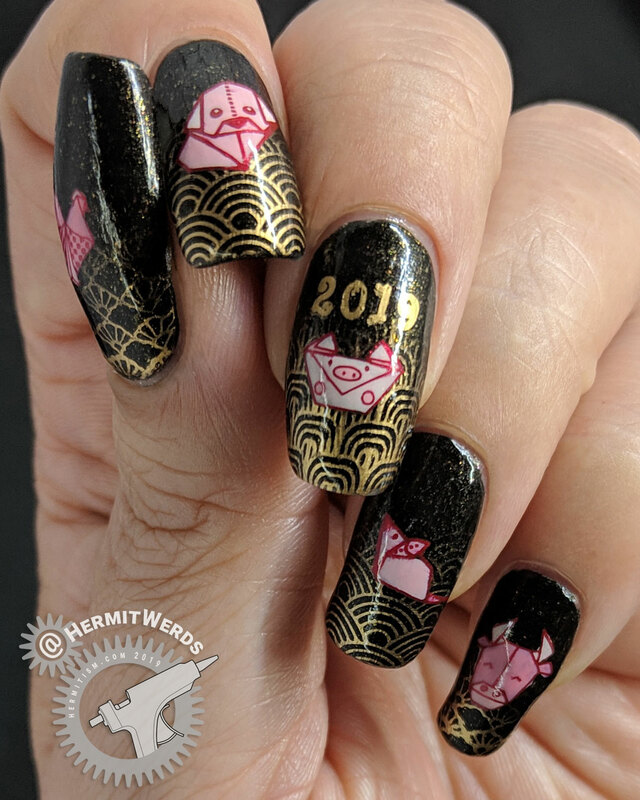 I have yet to see origami stamping images for snakes, let alone an eastern dragon, but bracketing the year of the pig with the two years of zodiac beasties before and after it proved possible. So we have the rooster (on my thumb) for 2017, the dog for 2018, the pig for 2019, the rat for 2020, and the ox for 2021. 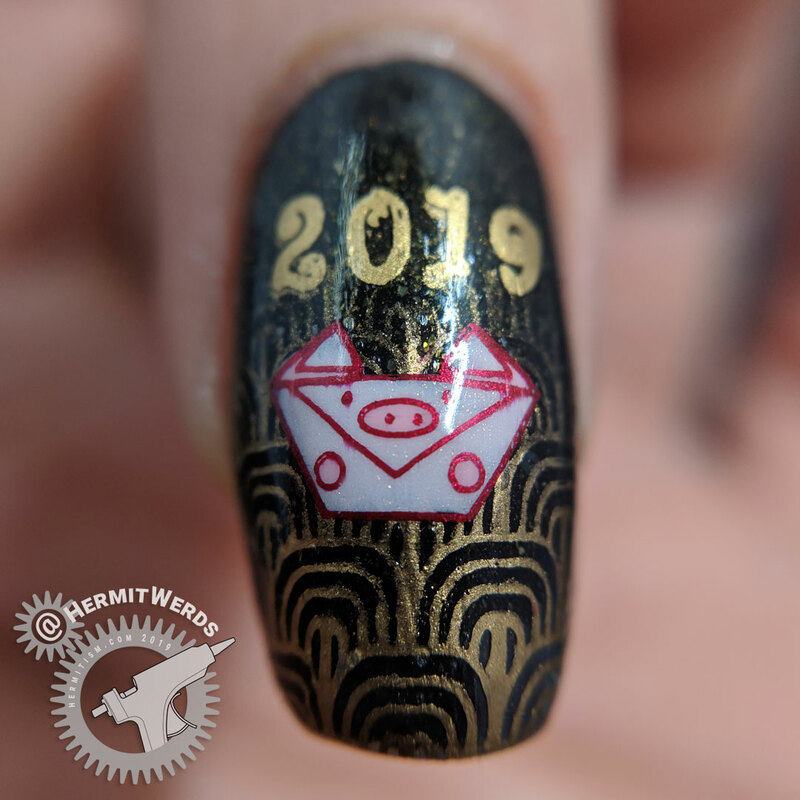 Strongly red and gold designs are typical for Chinese New Year nails, but I’ve broken the mold before today and probably will continue to do so. Some of my motivation for this was using Covergirl’s “Black Gold” for the first time on the blog. 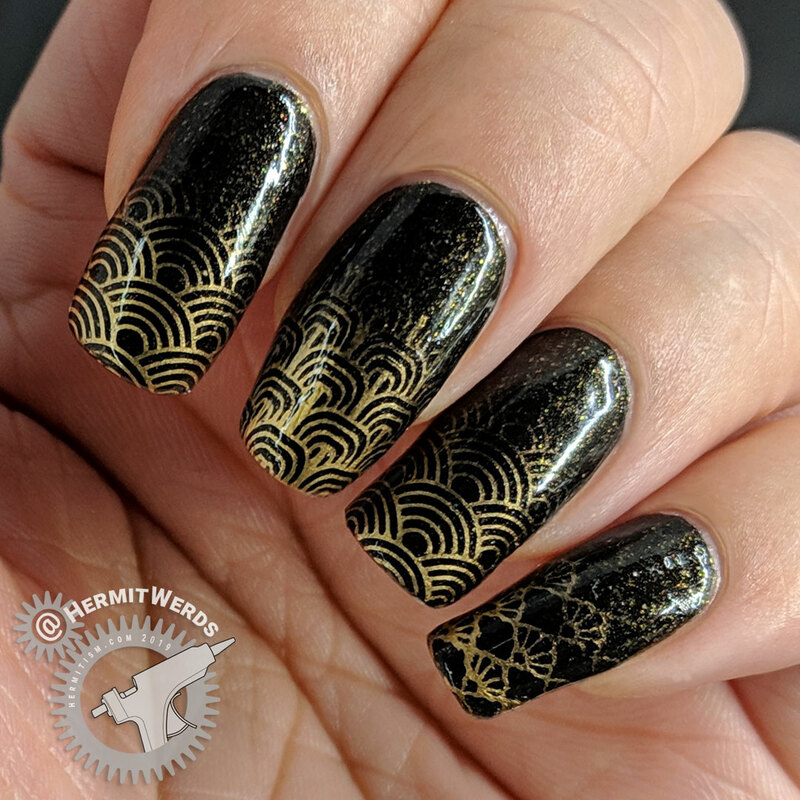 An old polish, but still fun. 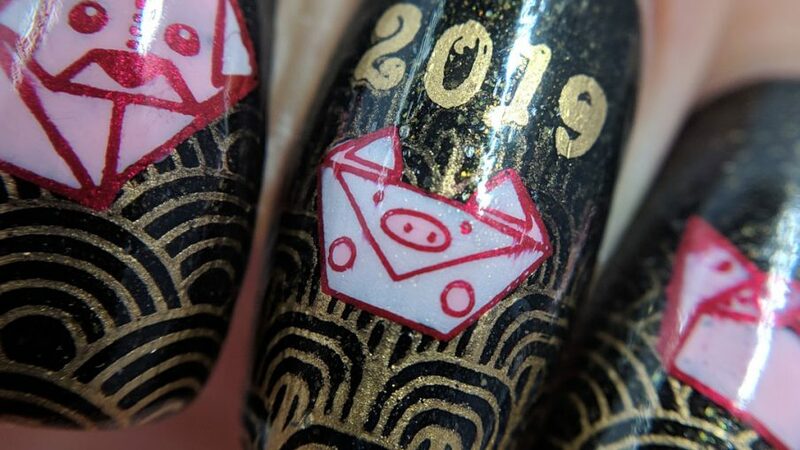 I will likely stick with red and gold if I paint another Year of the Pig design before the new year passes. There are so many cute designs in this collage. And you can see as well that some have chosen to stick with red and gold while others have forged their own path. Only having to paint one nail certainly opens the door to creativity!